…and I do mean scenesters. After all, they were there to watch Karl Lagerfeld’s film, Remember Now, the 17-minute on-screen romp of the pretty, precious and pampered set which preempted the Cannes Film Festival by a couple of days. Leave it to Uncle Karl to upstage Cannes – like showing up at a wedding rehearsal dinner the night before, in the bride’s gown. Tsk. Tsk. I am King of Ze World! Of course, those in attendance were by association, also pretty, also precious and all so pampered. Diane and Josh ditched the slickness of the red carpet from the other night for an easy, breezy, ‘you know, like chillin’ by the Riviera’ look. They are so cute you could squeeze their cheeks! Love Diane’s basket, complete with Chanel chain bag. It says, ‘I am just like the rest of you, except I am friends with one of the biggest creators in the universe, so like, I get free stuff like baskets with Chanel bags.’ And balls. Silver balls. If you hear a twinge of something in my voice…it is the fact that I am tremendously jalouse. 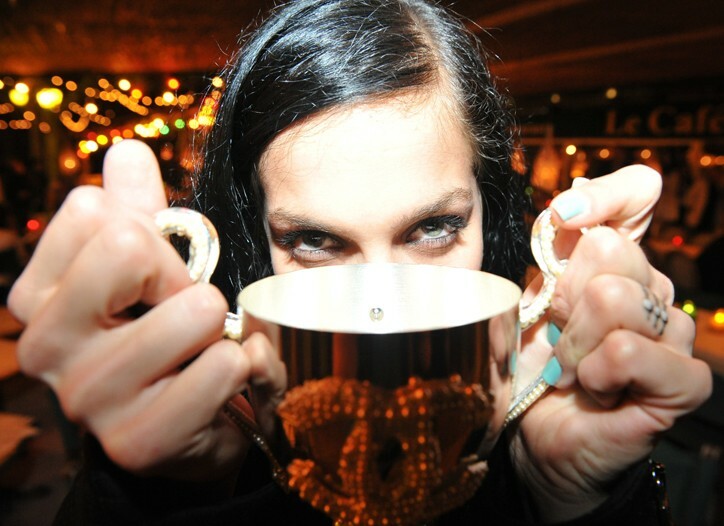 Party fixtures Andre, Leigh Lazark and Olivier Zahm. Derek B must be taking the pic? There were the usual suspects, the rockstar/model offspring, the models…and alas, the modelizers. Sophia Hesketh shines on while artistically displaying her glass. It's all in the technique, kids. Don't try this at home unless you are a professional. Of course, there was fashion royalty as well. She was the mystery woman on Karl’s arm at the Met. 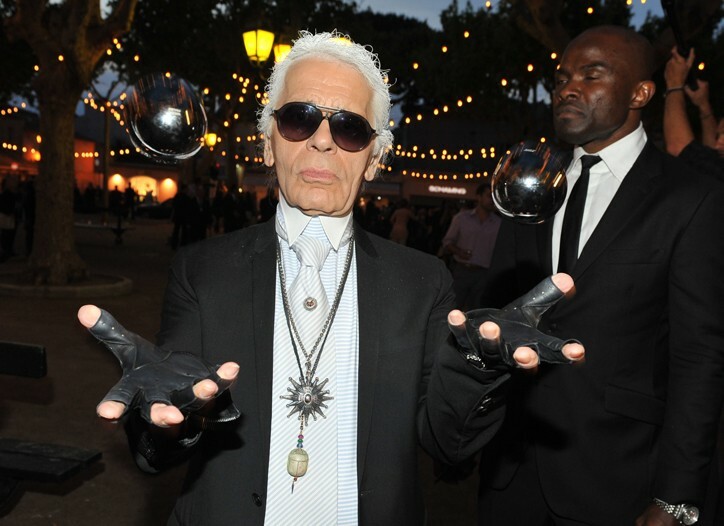 Well, we know Lagerfeld likes his muses and like his vocations, there are too many of them to count. The lovely Elisa Sednaoui is one of the stars of Remember Now and is very au courant, indeed. The fabulous Ms. Elisa - "cooler than ice cream and warmer than the sun"
She looked gorgeous (again!) – this time, in a fisherman’s sweater sun dress with classic Chanel chains that only Karl could concoct. Paired with flat, jewelled thong sandals and soft curls, it was perfect for finding a prince – or deux. Magician, transformer, juggler of numerous balls. …who else do you know that can juggle being a film-maker, designer of a thousand collections, photographer and beyond…and do each so impeccably well? I loved Karl’s ode to his surroundings with a matching striped shirt and tie. I am guessing the neck-piece and tie crest likely have a significance to St. Tropez aussi. Fashion is one thing, but darlings, it’s France – and the Riviera, no less! Add Uncle Karl’s extreme ingenuity to that and it’s dream-worthy. I can’t wait to see the Resort/Cruise collection tonight. Images: All images from WWD, except for #2 which is courtesy of Vogue Australia. And sorry, if I put this song in your head – by the incomparable Annie Lennox and Dave Stewart.